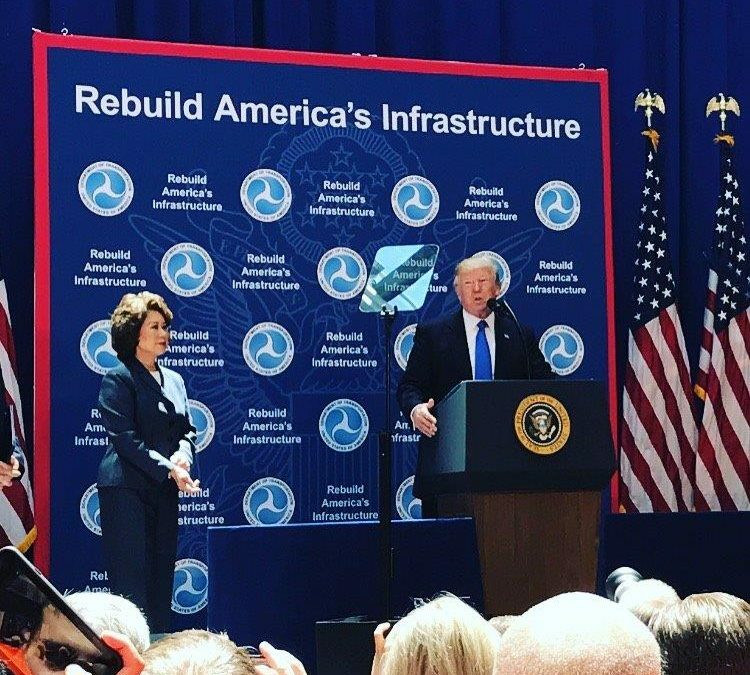 President Donald Trump spent most of the week talking about his plans to modernize and streamline how the nation builds roads, bridges and other infrastructure, despite the thunderclaps of other headlines coming from Washington, D.C.
On Monday, the president announced his support of a House Republican proposal to shift operational authority of the nation’s air traffic control system from the Federal Aviation Administration to a non-profit organization outside the government. Such a move, Trump said, will reduce congestion and delays, and help America modernize its aviation technology and improve safety. On Wednesday, the president traveled to the banks of the Ohio River in Cincinnati to address the nation’s inland waterway system and tout his approach to empower state and local governments to make infrastructure improvements. The following day, back in Washington, Trump met with governors and mayors to ensure them that the administration’s infrastructure policies will align with their needs. The president also complained about how environmental regulations drive up the cost of transportation projects, at one point dramatically dropping a thick report on the floor with a thud. This week, U.S. DOT announced an agency-wide review of all existing regulations and reducing barriers that slow transportation construction projects. The agency is taking comments until July 24 toward achieving that goal. Regulatory reform is a top priority for ARTBA and the association will continue to be closely involved with the administration’s efforts. ARTBA will submit its “Ripe for Reform: Federal Regulatory Issues Impacting Transportation Project Delivery” report and continue to work with its membership toward developing additional suggestions. Please contact Nick Goldstein for more information. The Friday audience at U.S. DOT included House Transportation and Infrastructure Committee Chairman Bill Shuster (R-Pa.), a champion of privatizing the FAA, and other members of Congress; ARTBA senior staff and other transportation infrastructure advocates; and labor groups. Earlier, Trump met with several state secretaries of transportation. ARTBA’s Nick Goldstein, Eileen Houlihan and Mark Holan contributed to this report.